Home Sweet H-…where am I again? We’ve established that I have a terrible sense of direction, right? Right. If I didn’t, I wouldn’t have this blog. Well…I might, but it would probably be named something entirely different, and I’m sure I would have run out of stories to talk about a long time ago. But for the first time in a long time, I’ve decided to talk about an actual “lost” story. Sit back and relax. Feel free to skim over the angsty quote from my poetry, but it seemed appropriate. A little known fact about myself: I didn’t get my driver’s license until the day I left for college. I had planned to get it earlier that week, but I erm…well failed that test which was deceptively easy. The driving instructor pitied my existence after I failed it the first time, so she let me retake it after a few days (even though I think I was supposed to wait a month), and I passed it the morning I left for college. My first road trip involved weaving through the construction outside of Little Rock and my father yelling at me, saying that driving under the speed limit was not acceptable. I lasted about an hour before I lost all feeling in my hands from gripping the steering wheel. That was part of the reason I traveled home infrequently. I. Hated. Driving. My first semester away at college, I think I visited home a handful of times. I returned for holidays, of course, but I never wanted to drive back for the weekends. I wanted to hide in my room, sleep for 16 hours straight, and “catch up on homework.” (Note: I’m fairly certain I never caught up. I might still be behind.) But I remember traveling home for the first time, not very well, but the memory’s up there in my noggin. I wanted to go see my friends at a football game at my old high school. My old high school terrified me at the time; actually, it still terrifies me. I returned there recently, and I was too scared to go to the bathroom because the little high school Kat in my head was saying, “Just hold it. You don’t wanna’ sign for detention. It’s not worth it.” (Note: If we wanted to use the restroom at my high school, we had to sign for detention.) But it was just a football game. My father drove me to that school five days a week for two years. I figured I could get there without much trouble. Eight minutes of driving. Right? Wrong. I left with thirty “just in case” minutes to spare, and I was still half an hour late. I must have taken a wrong turn in Albuquerque or something, but I ended up in quite possibly the scariest neighborhood I had ever seen. As my car slid past a few beat up houses, people came out to stare at me. I finally turned into a gas station, activated my GPS, and let it do the navigating for me, but I’m still ashamed of that moment. How in the world could I get lost in my hometown, a place I had lived for a few years? Maybe I’m unobservant (or selectively observant). Maybe I could blame my bad sense of direction. Maybe it’s because I was seeing my hometown through the eyes of a driver for the first time. Or maybe it’s not home. My family doesn’t live there anymore, and I doubt we’ll ever return. I left behind a few good friends, but after I graduate from college, part of me doubts I’ll ever live in Arkansas again. (I’ll probably regret writing this statement sooner or later.) It’s weird how a home can feel as though it isn’t one. My dorm room (even though it changes every year) has almost always felt like a home to me. It’s weird thinking that in a few months, I’ll technically be homeless. But here’s to hoping that I’ll find a new one, a better one. Anyone else ever feel lost when you’re at home? I’m still trying to figure it out, and maybe it’s because I live something of a vagrant lifestyle, but maybe once I settle down, things will be a little clearer. Thanks for the comment! It is not easy and settling down may help you. I call myself a modern day gypsy. I have made 3 moves in 3 years and this third moving coming up will be a settling down and nesting a bit move, which will be nice to have a place to call home for a while. I feel the same way. I’ll probably end up traveling for a few more years before I settle down, but I suppose now’s the time to do it. This sounds a bit like my driving. I got my license the day before I turned 18. Went to college with no car. The only times I went home (3 hours away) was when my parents drove and picked me up and drove me back. My last year of college I finally had to drive for student teaching, and then I drove home on the weekends an hour away. Now, I always have a GPS in the car because I’m so bad with sense of direction I could get lost in 5 minutes! SAME. My family ended up moving 14 hours away during my sophomore year of college. I’ve gotten used to long road trips, and I don’t mind driving as much… But I’ll always get lost. I really feel that way and it makes it a lot easier for me not to be caught up on material things. Give me Internet and I’m happy lol. Thanks for the encouraging comment. 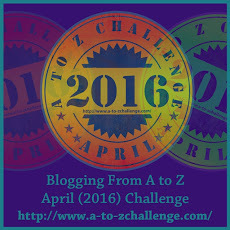 (I’m excited for a to z challenge myself.) That’s a really wonderful way to look at it. I’m in the process of planning a road trip, and my sister and I realized that we have so many friends all over, that we don’t even need to plan for hotels.